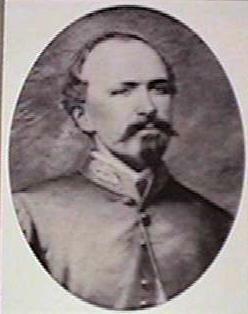 Mexican War veteran and Kentucky businessman John H. Morgan joined the Confederate army as a captain of a cavalry squadron in April 1861. By December of the following year he had risen to the rank of general and was on his way to becoming one of the most famous and most successful of the Confederate cavalry leaders. His December 14, 1862, wedding, the social event of the war in the western theater, was officiated by Episcopal minister and Confederate General Leonidas Polk and was attended by Gens. Braxton Bragg, William J. Hardee, Benjamin Cheatham, and John C. Breckinridge. Morgan was noted for his swift and daring raids into Union held Tennessee and Kentucky, the destruction he and his raiders caused to Union supply lines and garrisons, and the fear and consternation he inspired in Northern cities, where citizens dreaded a visit from "Morgan and his terrible men." The long series of successful raids came to a halt in July 1863, when Morgan ventured too far into Northern territory. He was raiding through Indiana and Ohio when he and most of his men were captured. Instead of being treated as a prisoner of war, Morgan was confined in Ohio State Penitentiary and had his head shaved as though he were a felon. After four months in prison Morgan engineered a daring escape and made his way back to Confederate territory. After being feted in Richmond in celebration of escape, Morgan returned to making his daring raids into Kentucky and Tennessee. At dawn on September 4, 1864, the house in Greeneville, Tennessee, where Morgan had stayed for the night was suddenly surrounded by Union cavalry. Morgan was shot and killed as he raced through the yard in his nightshirt, trying to reach his horse in the stable. When the Yankees departed and Morgan's men came to the house, they found the Union soldiers had respectfully brought Morgan into the house and laid out his body for burial.